[London: Wednesday 26th April]: Ballymore tomorrow launch twelve luxury penthouses for sale at Wardian London, offering residents a botanical oasis with panoramic views of Canary Wharf and the City. 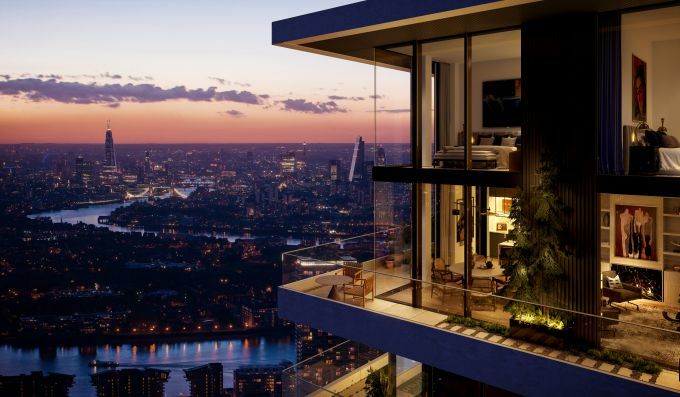 The homes will offer buyers the gift of time, being ideally located to the financial districts of Canary Wharf and The City. Situated overlooking South Quay in London’s Docklands, the Wardian penthouses are Wardian London’s premier residential units. The penthouses sit atop two magnificent towers rising to 50 and 55 storeys, each comes complete with a spacious garden terrace up to 32.7 sq. m in size. The launch includes four three-bedroom and four two-bedroom apartments in the West Tower, along with three two-bedroom and one three-bedroom apartment in the East Tower. Penthouses start from £1.85m. Wardian London takes inspiration from the Wardian case, the 19th Century creation of Dr Nathaniel Bagshaw Ward which revolutionised the transportation of exotic plants across the globe. Designed by Glenn Howells Architects, the development is a testament to Ward’s botanical legacy and is characterised by bold lines and geometry. This 21st Century modernism is fused with innovative landscaping to achieve the best use of space and light, and the communal spaces, from the atrium to the private outdoor swimming pool, will showcase over 100 different species of exotic plants. The penthouse interiors have been styled by a bespoke team of designers who drew inspiration from the developments unique eco-concept and make use of a plethora of natural organic materials and an earthy colour palette. Such an approach seeks to blur the boundaries between the privacy of apartment living and the luscious vibrancy of the innovative sky gardens so that when all the windows are opened up the space and colours transition from the external space to the internal seamlessly. Traditional craft techniques were used to give the interiors an artisan’s touch, with unlacquered marble, stone and brass, as well as raw, shaved, organic times to lend a hand-finished feel. The development is defined by its connectivity, perfectly suited for the modern buyer whose most precious commodity is time. Not only do the penthouses provide a tranquil escape, they seamlessly coexist with one of London’s most vibrant and well-connected commercial centres. Just a three minute walk from Cabot Square, Wardian boasts superior transport links to destinations across the capital. The introduction of Crossrail in 2018 will improve connectivity further, dramatically cutting travel times and linking Canary Wharf to London’s other major business hotspots. London City Airport also provides a convenient route to the continent and beyond. In keeping with Ballymore’s commitment to embracing green spaces, Wardian London has its very own indoor and outdoor landscaping service. Tailored to fit residents’ lifestyles, ‘The Gardener’ offers seasonal plant packages and comprehensive garden maintenance to maximise the floral variety of each penthouse. In addition, every resident will become a member of The Wardian Club, allowing access to exclusive facilities including a 25m open air swimming pool, gym, cinema, two restaurants and a vibrant rooftop observatory. A 24 hour concierge service is also provided.